Modern technology is all about synchronizing your devices, so why not use iCloud on your MacBook? Today’s Apple iOS devices can play the same media: photos, music, books, TV shows, and such. (Some iOS devices, such as your iPhone and iPod touch, can share applications that you install.) Therefore, it makes sense to share all your digital media, and that’s what iCloud is all about. Apple calls this synchronization pushing. Here’s a look at how the pushing process works. Imagine that you just completed a Pages document (an invitation for your son’s birthday party) on your MacBook, but you’re at the office, and you need to get the document to your family so that they can edit and print it using your son’s iPad. 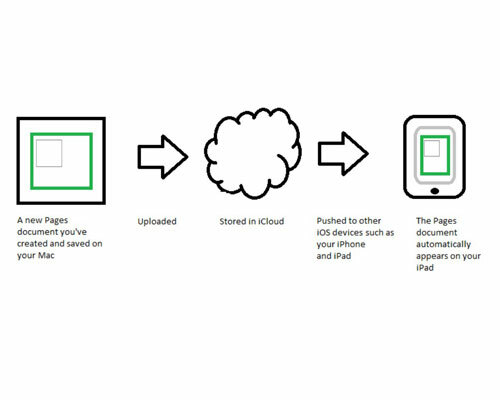 Before iCloud, you had to attach the document to an e-mail message, or upload it to some type of online storage such as Microsoft’s SkyDrive, and then a family member had to download and save the document to the iPad before working with it. iCloud isn’t limited to just digital media, though. Your MacBook can also automatically synchronize your e-mail, Calendar calendars, and Contacts entries with other iOS5 (or later) devices across the Internet, so staying in touch is much easier. Apple also throws in 5GB of free online storage that you can use for all sorts of things: not only digital media files but also documents that you’d like to save online for safekeeping. In fact, items you buy through the iTunes Store — music, video, and applications — do not count against your 5GB limit. To join the iCloud revolution, you need an Apple ID. If you didn’t create an Apple ID during the initial Mountain Lion setup, you can create one from within the App Store. You control all the settings for iCloud from Mountain Lion’s iCloud pane in System Preferences. Click the System Preferences icon in the Dock and then click the iCloud icon. At the sign-in prompt, enter your Apple ID and your password. System Preferences will then guide you through basic iCloud configuration with a number of questions. Photo Stream: Turning on Photo Stream allows your laptop to automatically receive photos from your iOS devices. Take a photo with your iPhone, for example, and that image is immediately pushed to your MacBook, iPad, and iPod touch. On the MacBook, however, Photo Stream goes one step further: The photos appear automatically in iPhoto or Aperture within a special album titled Photo Stream. To turn on Photo Stream in iPhoto, choose iPhoto→Preferences, click the Photo Stream button, and then select all three check boxes. Photo Stream must also be turned on in the iCloud Preferences pane. Back to My Mac: If you enable Back to my Mac, you can remotely control your MacBook from another Mac computer (or vice versa) using Mountain Lion’s Screen Sharing feature. You can also transfer files between the two computers. Back to my Mac works over both a broadband Internet connection and a local network. Available Mac computers show up in the Shared section of the Finder window sidebar. Note that you must manually turn on Screen Sharing in the System Preferences Sharing pane before you can remotely control another Mac. Now think about this: With Find my Mac, you can even lock or completely wipe your laptop’s drive remotely, preventing unauthorized use and erasing your private data! After you access your MacBook from another Mac or an iOS device, you can play a sound on the laptop’s speakers, send a message to be displayed on-screen, remotely lock the machine, or remotely wipe the drive. After you lock or wipe the drive, though, you can’t locate your MacBook on the map again. These data protection measures should be taken only if you have no other recourse! Naturally, Apple knows that you’re curious about how much space you’ve taken up in your own personal iCloud. 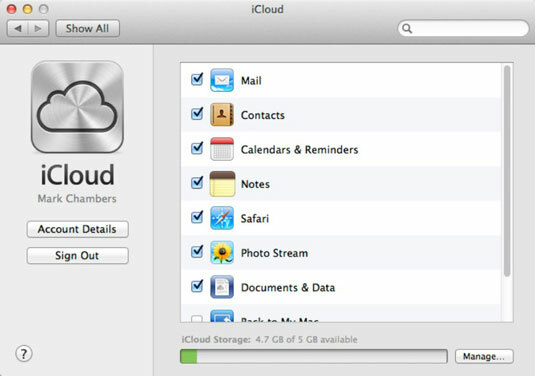 To monitor your iCloud storage, click the Manage button at the bottom-right corner of the iCloud Preferences pane. From the sheet that appears, you can see how much space you’re using for document and data storage. 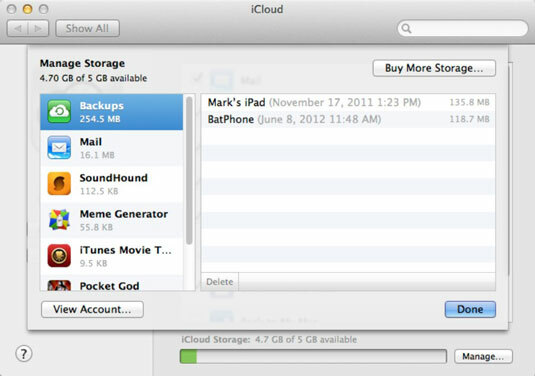 Click the data type in the left column, and iCloud displays the amount of storage space that’s being used for that data. Other items that might appear in this sheet include Mail and selected iPad and iPhone apps that support iCloud. If you find yourself running out of iCloud storage space, delete any stored item by selecting it in the list at the right side of the sheet and then clicking Delete. And if you need more elbow room than 5GB, Apple is happy to provide 10, 20, or even 50GB of additional storage for an annual subscription fee of $20, $40, or $100 per year, respectively. Click the Manage button on the iCloud pane in System Preferences, and then click the Buy More Storage button.